My wife’s family has a saying: “You Can’t Always Get What You Want Tim Tim” (sung like Mick Jagger). Poor Tim is the youngest sibling out of five and probably learned what low man on the totem pole meant early in life. Even though he’s an adult now and is in medical school (but often “forgets” his wallet to get everyone back) the saying sticks with the family. 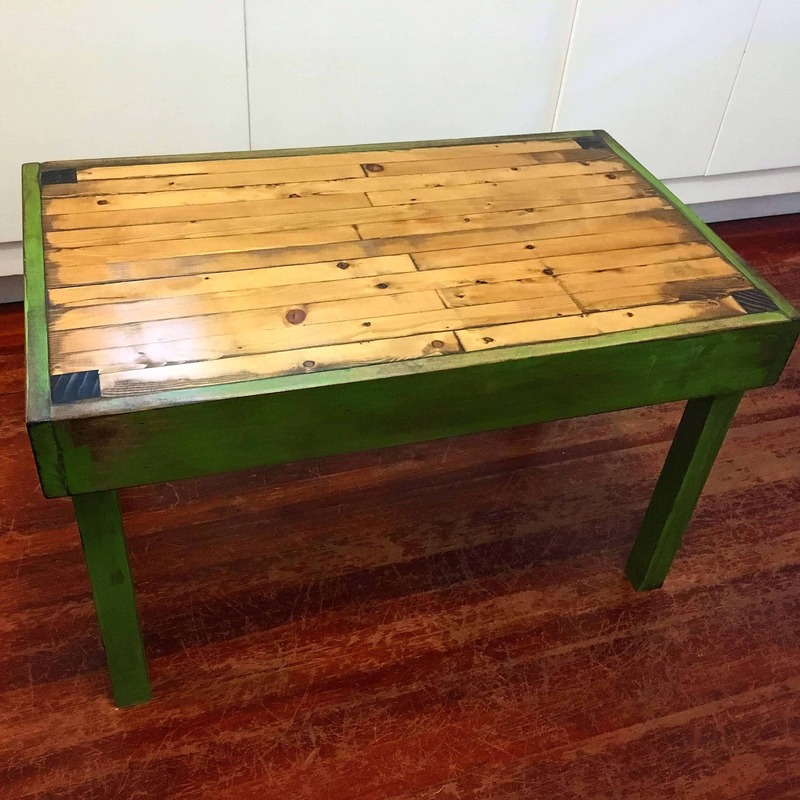 Which is why when my wife asked me to build a children’s table and chairs for a charity auction and I only ended up making this table, I could look her right in the eye and say “You Can’t Always Get What You Want Tim Tim” and only get a slightly disapproving look. *Links below are affiliate links for the exact tools I used on this build. 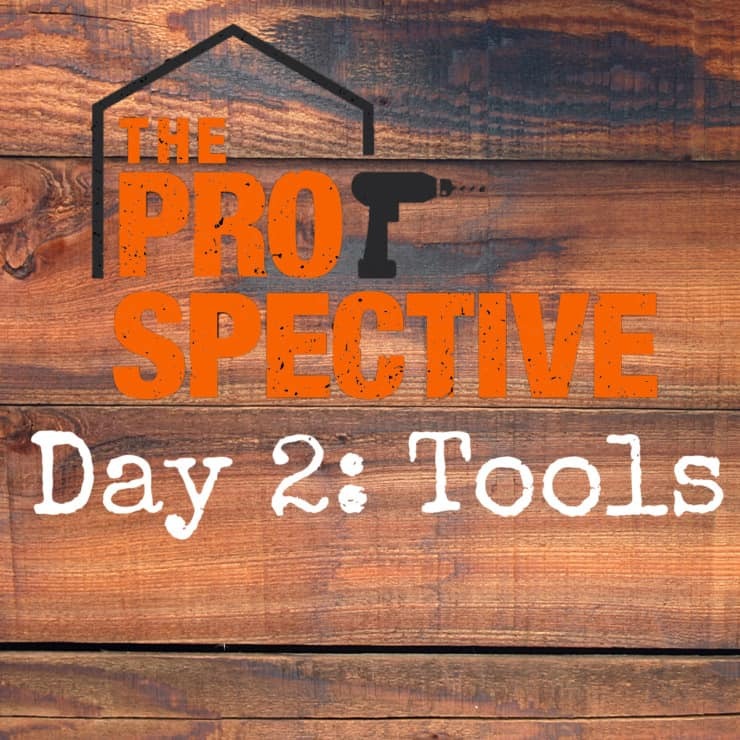 If you so happen to purchase one of these tools from the link a small portion of your purchase goes on to support this website at no additional cost to you. Free money! 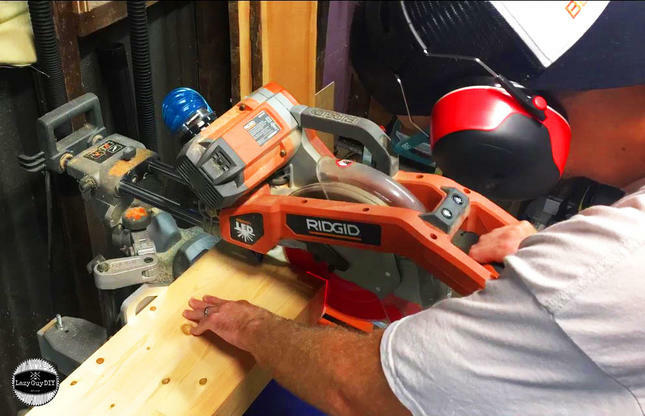 Cut your 2×4’s to 31″-32″ lengths. I left a little extra on just in case the planer took a little snipe out of the ends on a later step. This is completely optional, but I ran the board faces through the thickness planer to get an absolutely flush joint during the glue up. If you want to get really (pinky out) fancy you can cut the 2×4’s to create visible seams when you stain and seal later. Just know that the smaller pieces make for a little extra work during the glue up. What’s this? Lazy Guy creating extra work? Yeah, but not a ton. Apply wood glue between each layer and smooth it out. Drawing pictures and writing messages in glue is a rookie mistake. Don’t be a rookie Nuke. 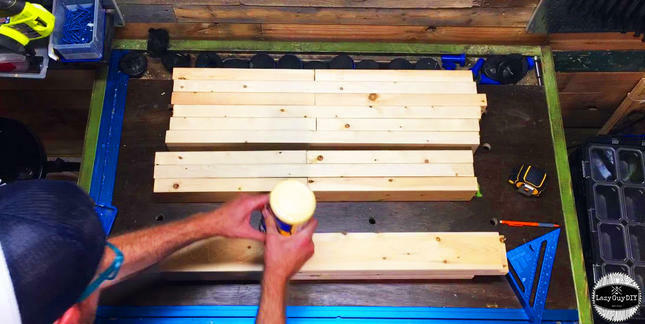 I use the Rockler Glue Brush on all of my glue ups (plus you get the satisfying glue peel when it dries). Apply glue to both sides thinly for the best adhesion and then clamp everything up! 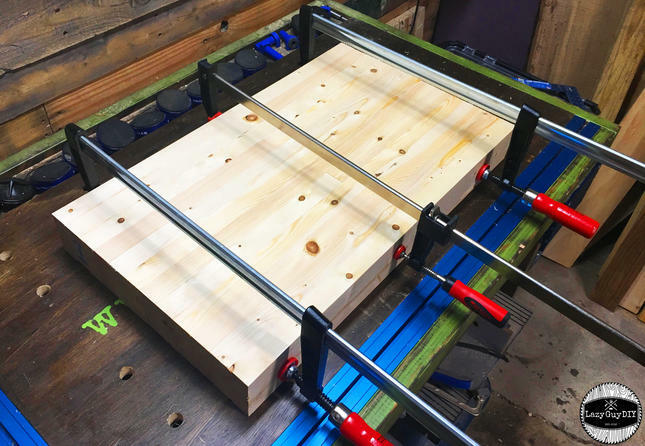 Because the thickness planer can only handle material 13″ wide I made two separate rows of six, but clamped everything together (without glue between the two stacks) to save on using too many clamps. If you’re one of those people who can’t wait to open up their presents, at least give the glue a few hours to dry and set before you move on to the next step. If you want the best results, pick this step back up the next day. 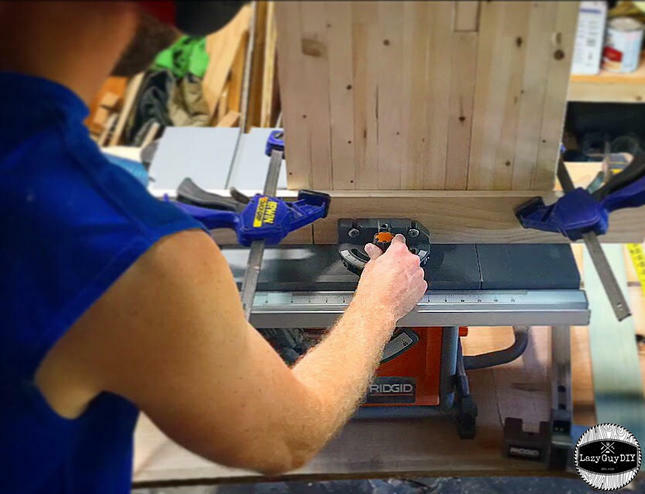 Set your thickness planer up and run your glue ups through taking off about a 1/16th – 1/8th” with each pass. Speaking of taking off… when I posted the pic above to Instagram there was some question about my errr… safety equipment. 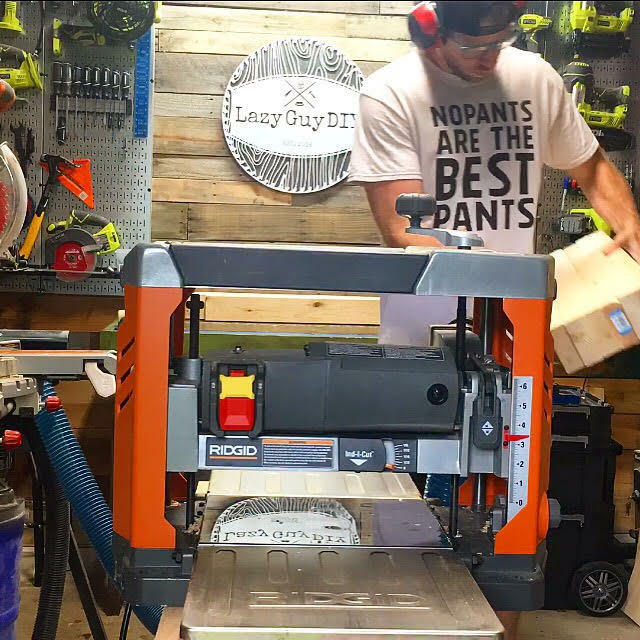 If there’s one set of rules I have in the shop it’s this: Pants First, Safety Second. 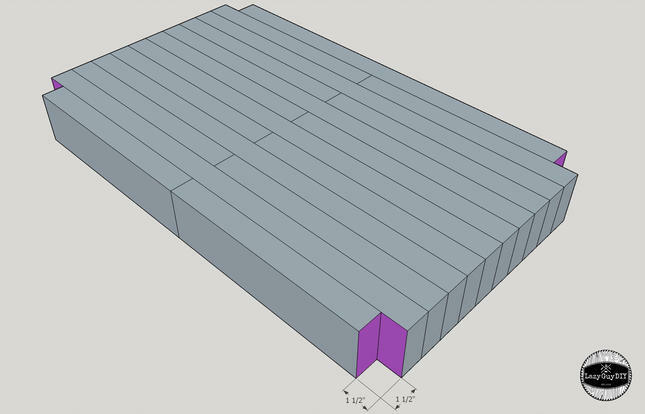 Make sure you pass both stacks through each adjusted depth with the thickness planer. The idea is to have them end up the exact same thickness. You’re going to plane them until the top is all one smooth surface. Remember that extra length we were keeping on the 2×4 stacks (if you listened to my advice you rebel)? It’s time to trim the fat. 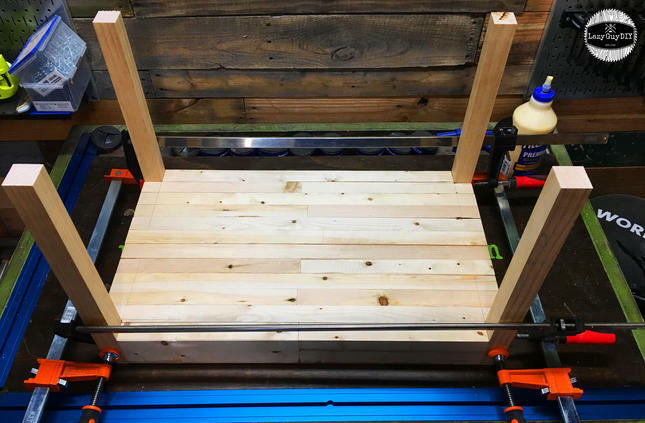 I used my sliding miter saw to cut the excess off but you can also use a table saw or a circular saw to even up the pieces. 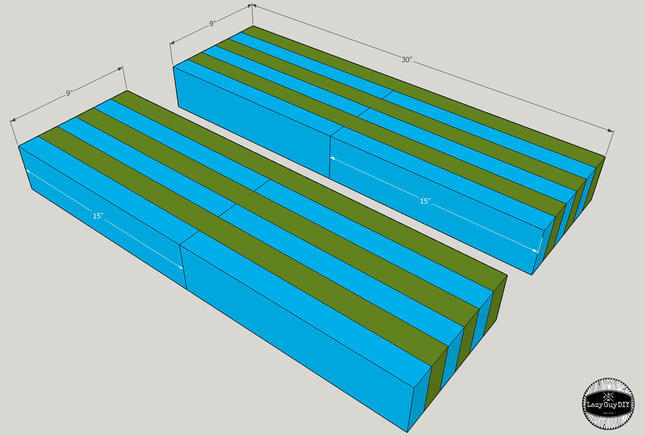 Once they are to the same length (30″ long)… it’s glue up time… again! Once again… don’t get impatient. You really need to let the glue up sit for a minimum of a few hours to let the glue set. Clean your shop or something in the mean time. It’s quite dusty. Well guess what smarty pants? 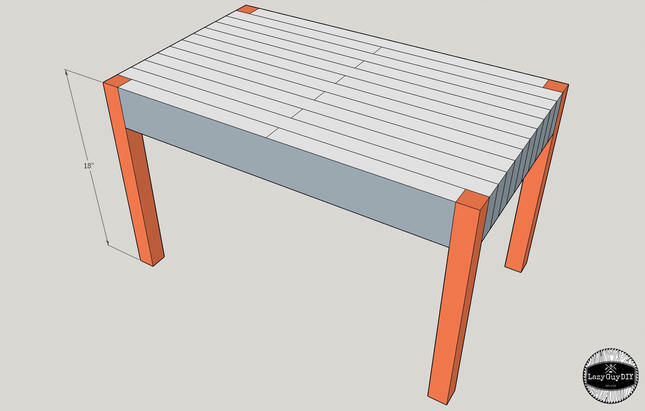 Since you planed the 2×4’s they are no longer 1.50″ thick like the 2×2’s you’re going to use for the legs. 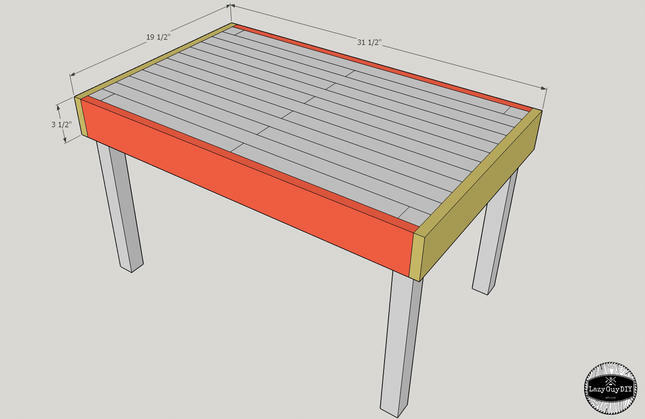 So you’re going to have to use some craftsmanship and cut the holes with your table saw. I first used a scrap piece of 2×2 to mark my cuts. I used a speed square to extend the marks so I could line everything up clearly with my table saw cuts. Then I ran everything through the table saw, making sure the blade cuts through the top of the table first to avoid tear out. To make life just a little easier, I attached a scrap piece of wood to my table saw miter gauge and passed it through the saw to see where the cut would hit. Then with a pair of speed clamps, I attached the table top to the scrap piece and rip cut the ends. For fun, I sprayed a little WD40 on the saw deck to make it extra slip and slide’y. Notice the aged look I got on the top of my table with the different colored leg tops? Here’s how we get there. 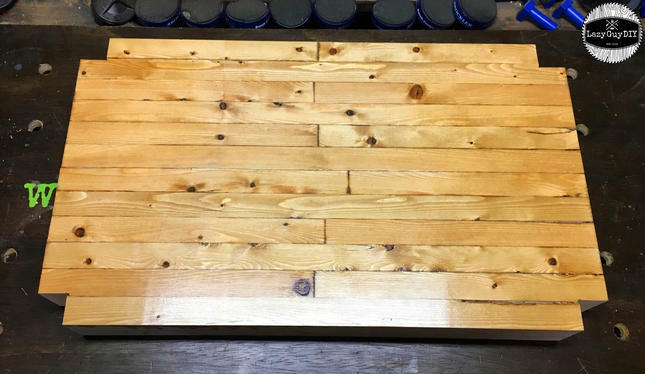 Stain your table top with a medium/light stain. I think I went with MinWax Special Walnut. Remember not to use the stain and poly mixes. Those are for people lazier than me. After the stain has dried (yes you have to wait again. Go hug a kid or something while you wait. 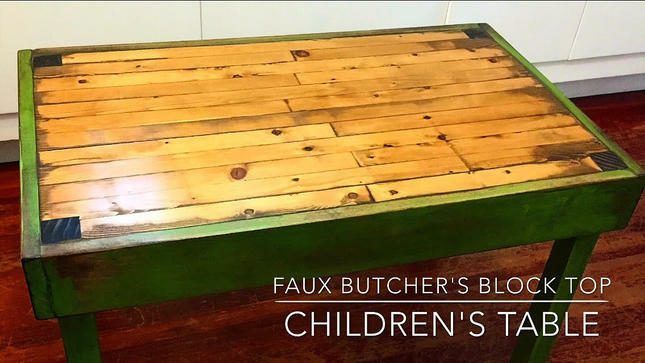 But your kid, not some strange kid…) apply a top coat or two of poly to seal the stain. I used Varathane triple thick semi gloss poly. Yeah that’s right, three coats at once. It’s like they know me. That nice and square 2×2 you’ve been storing in the corner is ready for it’s time to shine! Cut 4 pieces to 18″. Now flip the table top over and place the pretty side face down on a flat surface. Attach the legs with wood glue and if you’re feeling really ambitious pre-drill holes and attach wood screws to make this sucker bomb proof. Now for the forgotten 1×4’s! 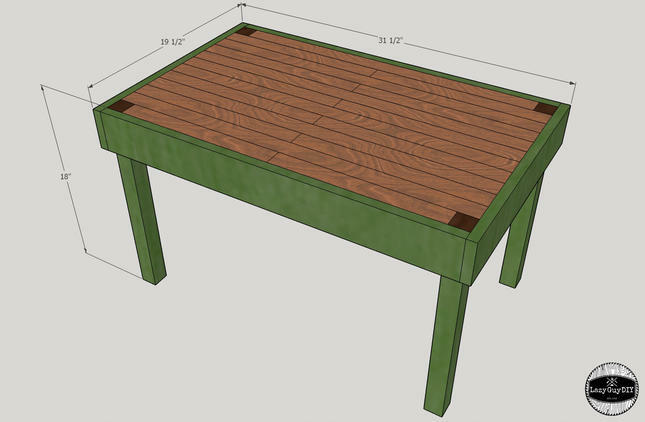 If all your cuts went according to plan, the dimensions of the table should be 30″ x 18″. 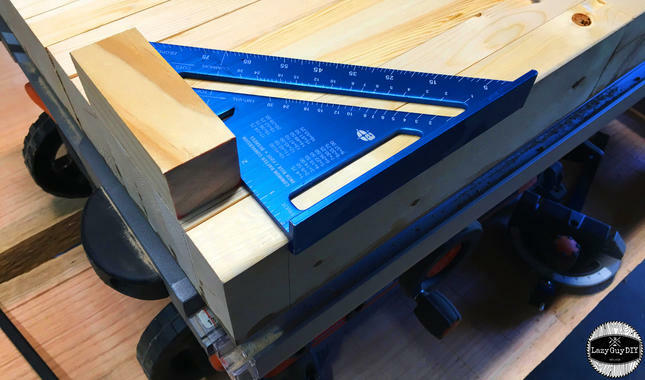 If that’s the case, cut the face aprons to 30″ and the side aprons to 19.50″ and attach directly to the 2×4 top with wood glue and brad nails. Patch any holes or gaps with wood filler, then sand smooth once it’s dry. With the legs and aprons securely attached it’s time to age this thing and give it some character. The method is simple, paint the aprons and the legs your base color. Let it dry. Then sand all the edges and areas within the flat surfaces with a random orbit sander. Use 220 grit sandpaper for only a little removed, use a lower grit count for a significant amount removed. 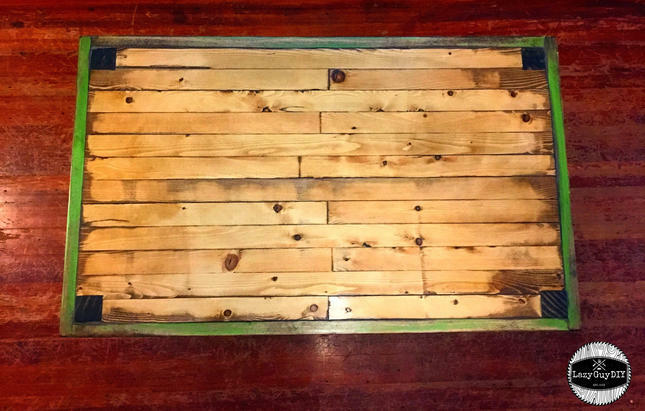 You are going to pull a dark stain over top so anything you expose down to bare wood is going to pick up the stain. For the top I hit the edges and seams with 220 grit as well pulling back some of the poly coat I already applied. With everything sanded I used a foam brush and a dark stain and coated the entire piece and wiped off the excess. 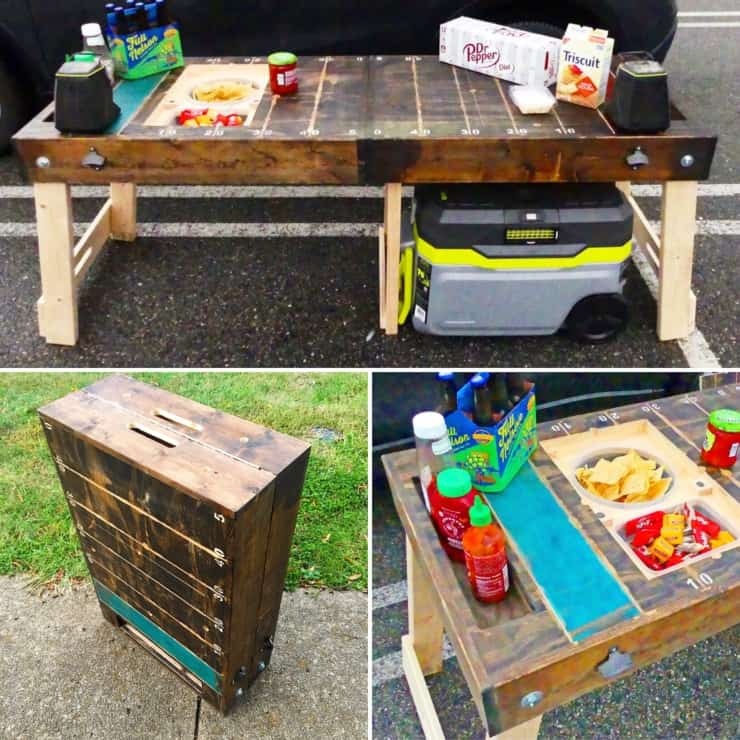 The painted areas darken and the stained top gets a weathered and aged look. 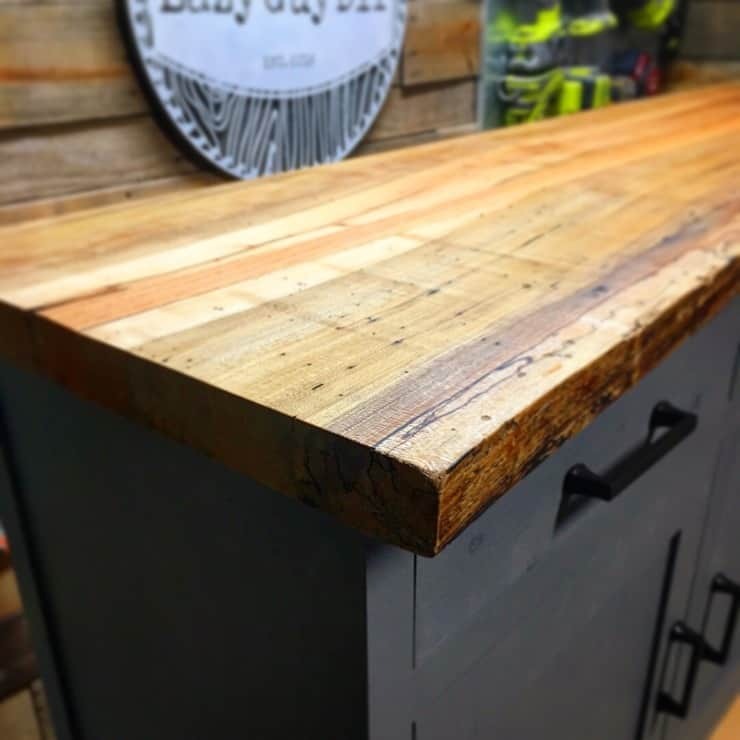 If you want, you could also distress the top before staining to make it look like it’s been well used. The dark stain will highlight those marks. Once the poly is dry, re-coat the entire piece with at least 2-3 coats of poly. Remember to lightly hand sand with 300+ grit sandpaper to get the smoothest finish.